You might spend 1/3 of your life sleeping on your mattress, but your mattress spends all its time being supported by your bed frame. 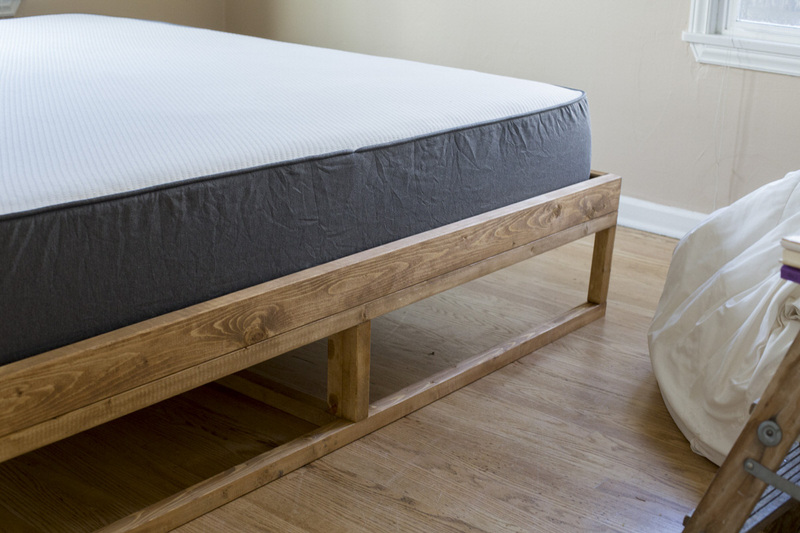 Here's a sleek and simple mid-century bed frame we made for under $100. 5 - SPF 2" x 4" - 8 ft.
11 - White Wood 2" x 2" 8 ft.
8 - White Wood 1" x 2" 8 ft. Accuracy is important: Remember, measure twice and cut once. 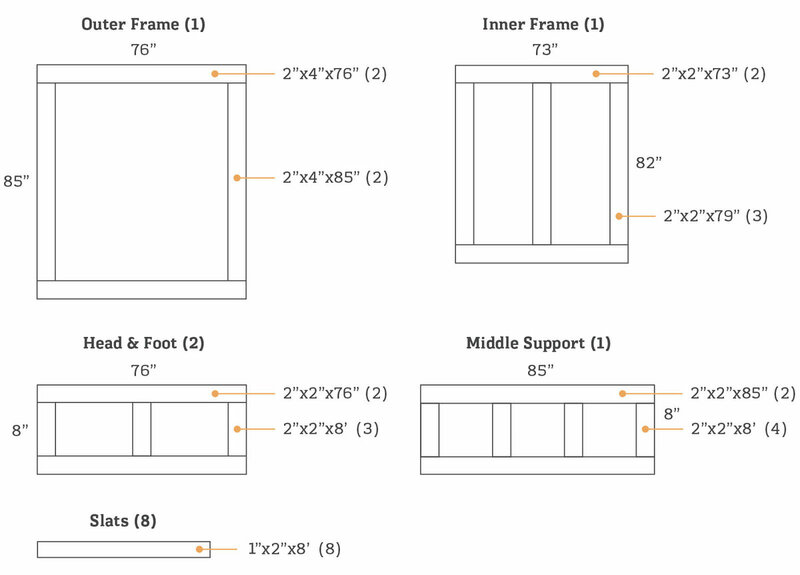 Above is a template of each cut we made, but keep in mind these measurements are for a Californa King mattress. 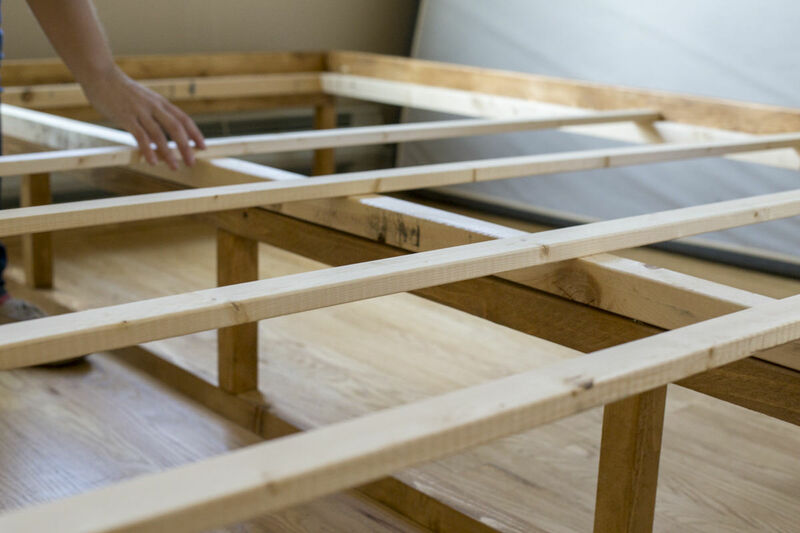 To adjust the template to your bed size, simply measure the length and width of your bed and scale them to fit this template. 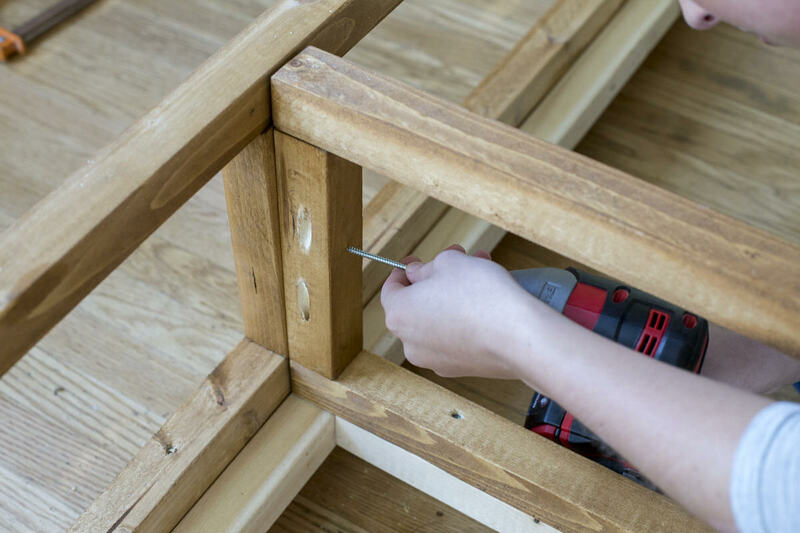 We used a miter saw to make these cuts, and cut everything before we began assembling any part of the bed frame. Note: this template will leave you with a number of extra 8" pieces. 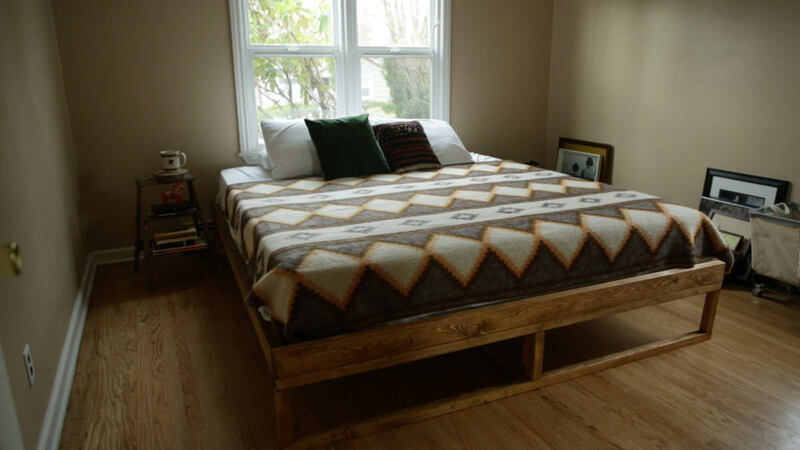 The bed frame dimensions only call for a total of 10. 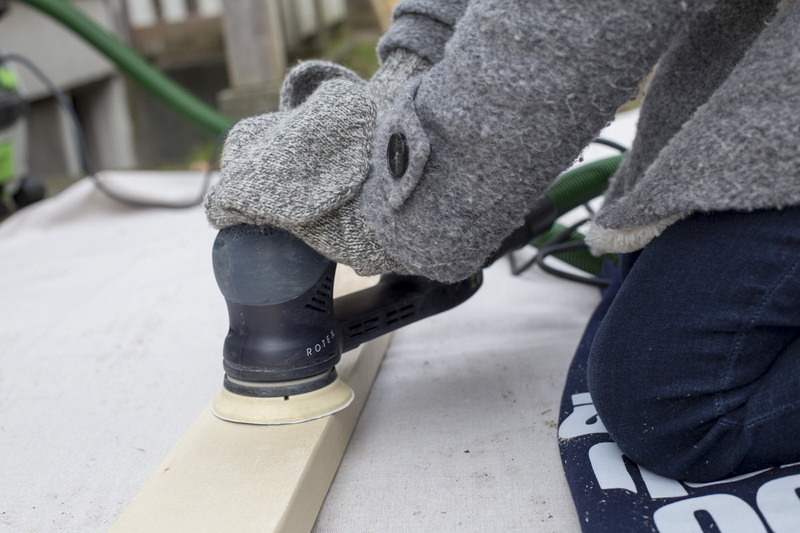 Sanding is an important step; you don't want to get splinters from your new bed frame! We sanded the pieces for the outer frame and the head, foot, and middle supports. This process would take a long time by hand, so we also used an electric orbital sander that helped expedite the process. 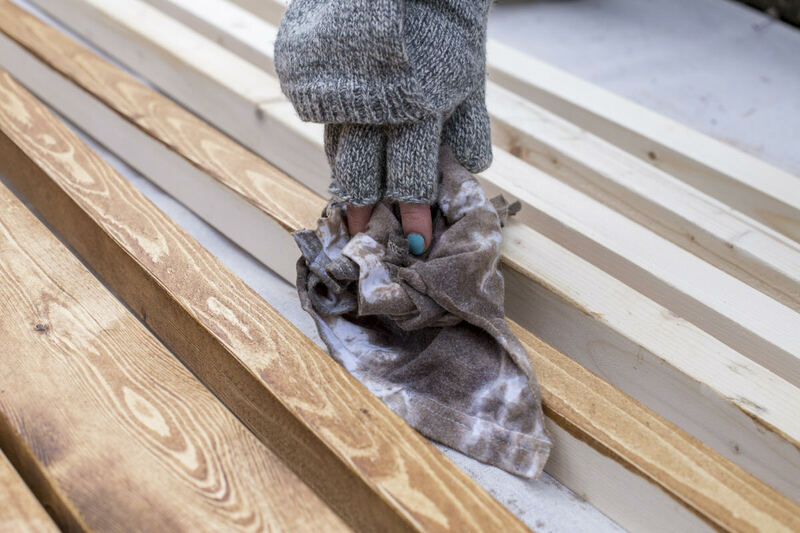 Make sure to sand off any obvious splinters or rough patches on the interior frame that might snag your bedding. Then, it was time to stain. We stained the pieces for the outer frame and the legs using Varathane Wood Stain in Golden Oak. Follow the directions on the can and wipe off any excess stain. Once all the pieces were stained, the instructions told us to leave them to dry for about 24 hours, so we came back to the project the next day after the stain was fully dried. At that point, it was time for assembly. We started this process by using a Kreg Jig. 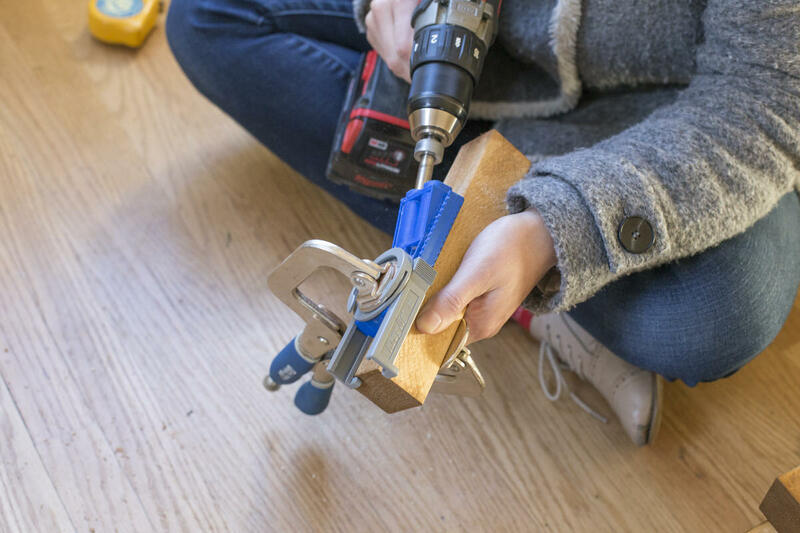 (If you've never heard of a Kreg Jig before or you're not quite sure how to use one, don't worry about it! 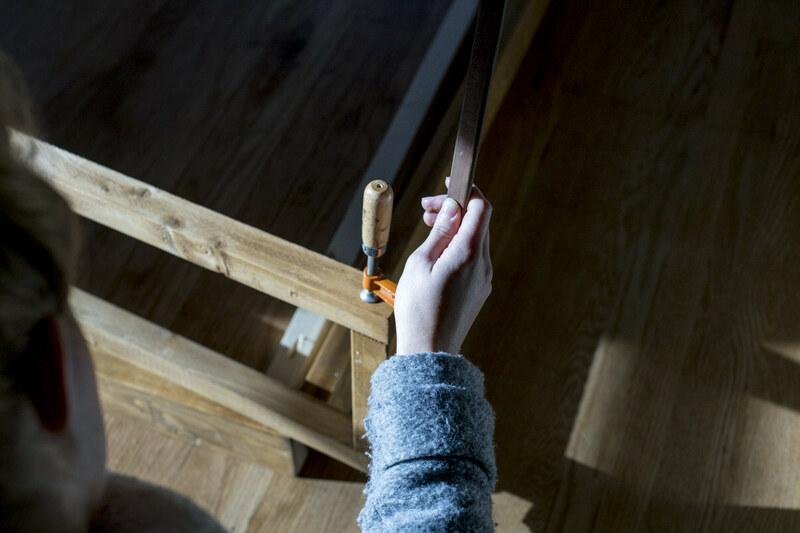 Check out our how-it-works Kreg Jig tutorial here.) 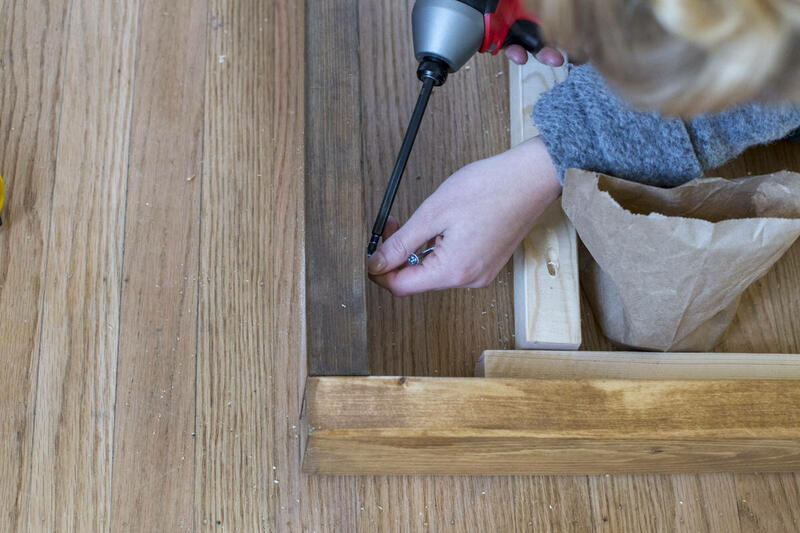 Keep in mind, this project can just as easily be completed without a Kreg Jig—you'll just end up with some visible screws. 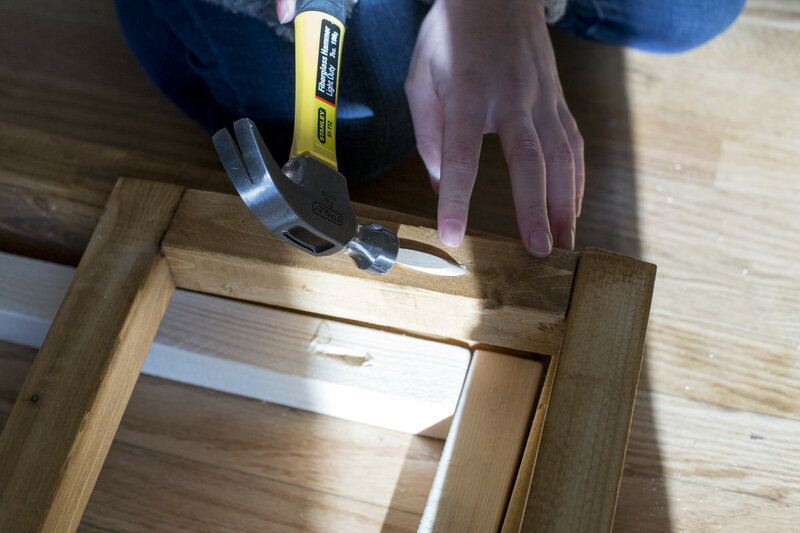 With the Kreg Jig set to 1 1/2" we predrilled holes in both ends of all the 8" pieces, and in the ends of both side pieces of the inner and outer frame (that includes the center piece of the inner frame). 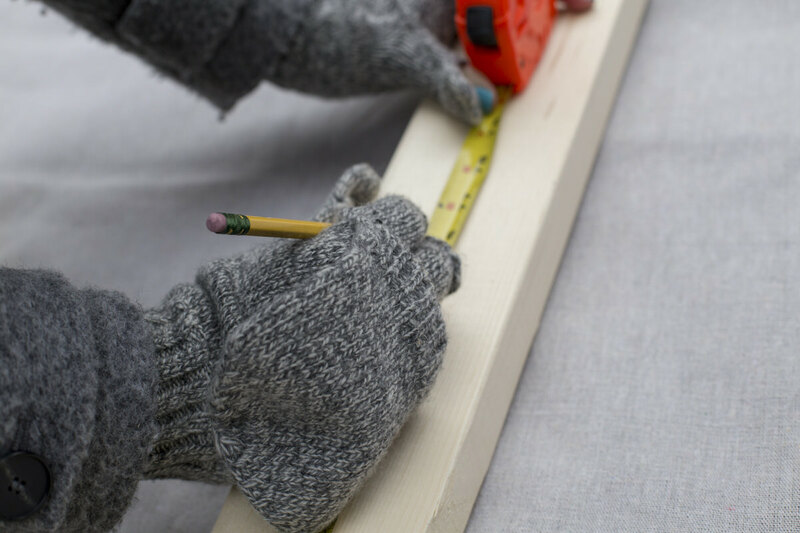 The 2" x 2" pieces should have one hole predrilled in each end; the 2x4's can fit two holes. 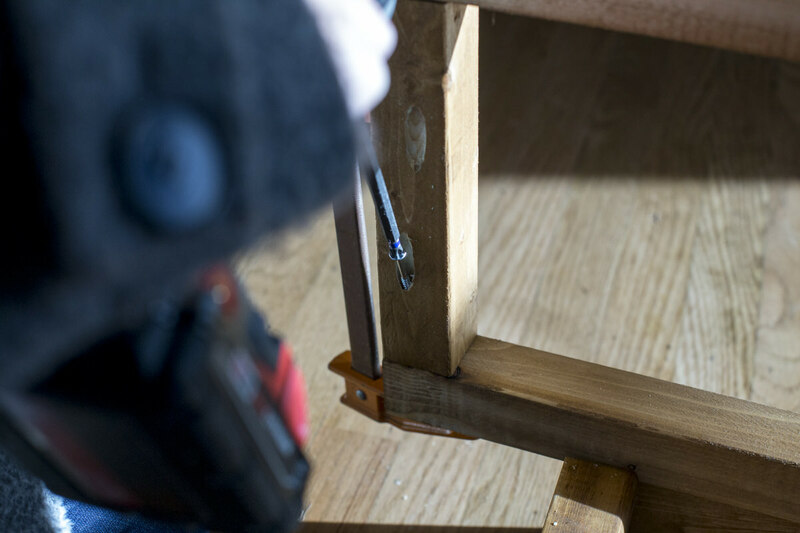 Using bar clamps to hold the pieces in place, assemble the legs for the head, foot, and middle support. For the head and foot pieces, keep the holes from the Kreg Jig facing towards the head of the bed. This way they won't be visible. For the middle support, turn the holes to the side so that drilling is made easy. Secure the screws with a 6" #2 Philips driver bit. Make sure the center pieces of the head and foot are right in the middle at 38 inches. Kreg Jig plugs can be stained and used to camouflage the holes. 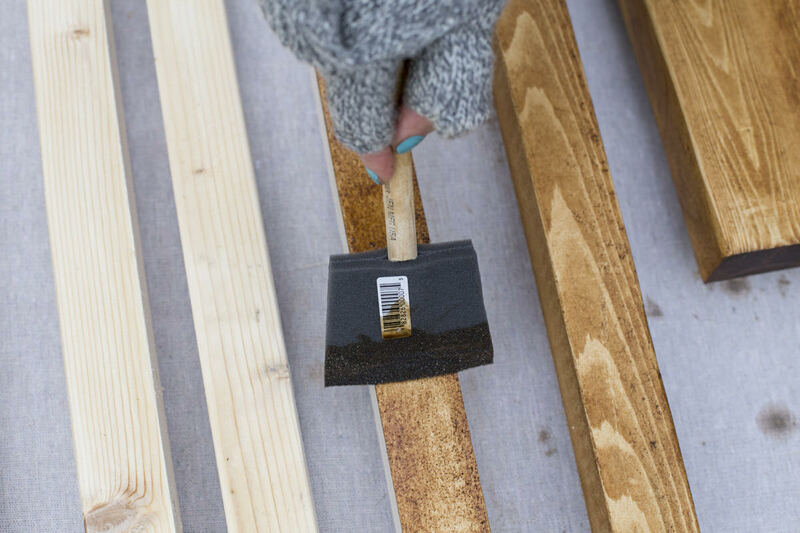 We used a hammer here, but to avoid breaking the dowel edge you can use a rubber mallet to get it into position. Use glue on the flat end of the plug to secure the plug in place. Position the inner frame inside the outer frame and attach to outer frame with five screws in each side (no pre-drilling necessary). Secure the inner frame to itself through the Kreg Jig holes. Position the centerpiece at 38 inches and secure it in place. Next, flip the frame over and dry-fit the legs on top. Secure the head and foot pieces to 2x4 frame with four (or more) screws. Line up the middle support along the centerpiece and secure it with screws. Secure the ends of middle support to the centerpiece of the head and foot. Step 13: Take a Nap! Now, make your bed, and enjoy your new mid-century space. Is your furniture dusty? It won't be for long. This DIY dusting spray leaves a shiny polished look that I love. The 3 simple ingredients in this spray are completely natural and exceptionally gentle on furniture. It's not uncommon to need extra storage in Seattle. Many of the apartments and condos are tiny, and if yours was built in the early 1920s, we know your closet space is at a minimum. This gas pipe storage system is the perfect solution to increase your space with both beauty and function! This kit is a wonderful, easy option for making a workbench. 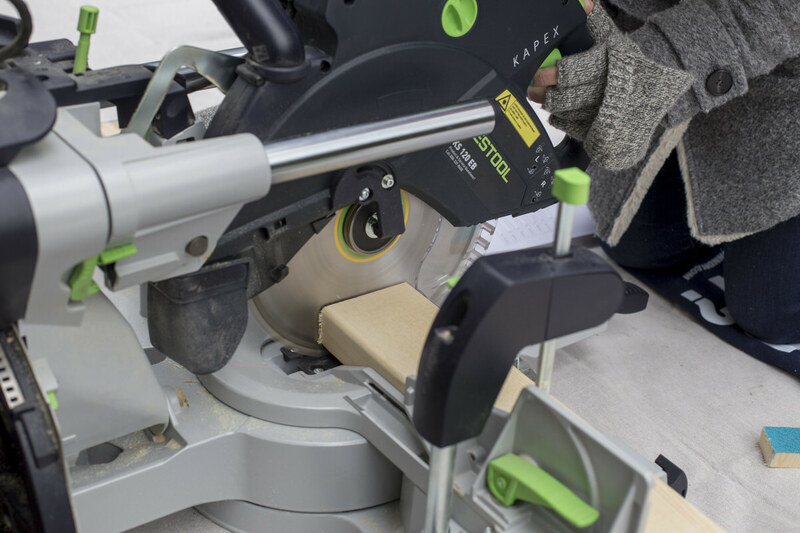 It has everything you need to make the bench except the lumber, a saw, and a drill. Brief instructions are included in the kit, but we thought we'd help you out and give more of a step-by-step tutorial.